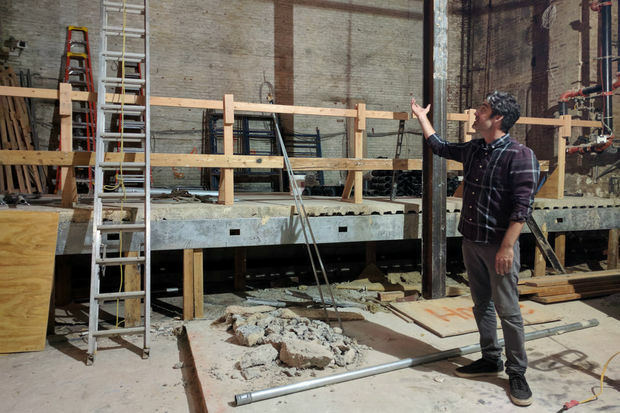 Nitehawk's owner Matthew Viragh gesturing toward what once was a sprawling vaudeville stage with a 50-foot high fly space. The space will be divided into a handful of theaters. PARK SLOPE — Eager film aficionados took a peek at the Prospect Park Nitehawk on Halloween where workers uncovered elaborate ceiling panels, a 1920s bronze door and the bones of a vaudeville stage, the theater's owner told DNAinfo New York on Tuesday. Nitehawk originally expected to welcome film buffs to the renovated movie house by the southwest corner of Prospect Park this fall, but after discovering original balconies and other hidden features the new owners pushed back its opening to March 2018 so builders could incorporate the pieces into the design. "Anywhere we can find it, we want to expose original features just to give people a sense of the original building," said Matthew Viragh, Nitehawk Cinemas owner. 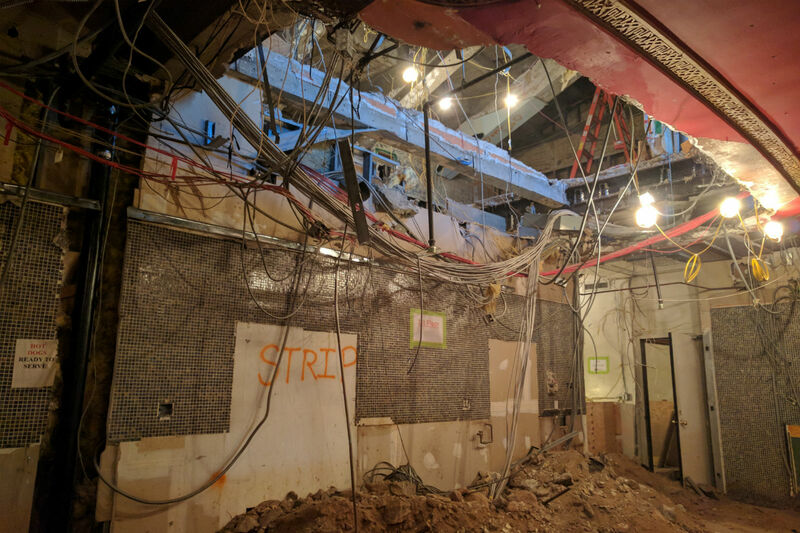 The theater's guts were on display Tuesday with a tangle of wires draping down from the exposed second floor into what used to be the Pavilion's concession stand. It will be transformed into a bar with another lounge on the second story, Viragh said. In the back of the theater, workers have stripped away most of the Pavilion to reveal the bones of a spacious vaudeville theater at least 50 feet high with remnants of 20th century catwalks way up near the roof. The former theater is being split into a double kitchen on the ground floor with the second story portion converting into theater space. 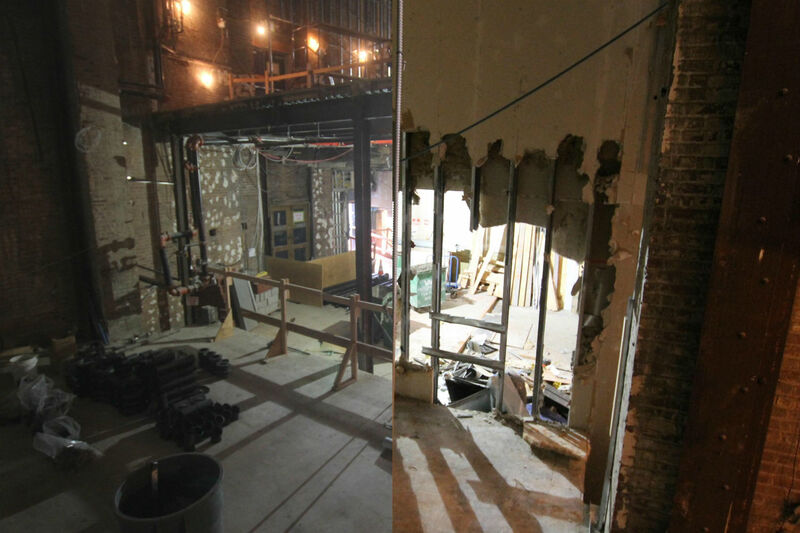 In a before-and-after photo, the right half is from three weeks ago and shows a wall that has since been torn down. The left portion shows the space as it is now. Each photo was snapped by Work Zone Cam — cameras that ve be viewed on the Nitehawk website. 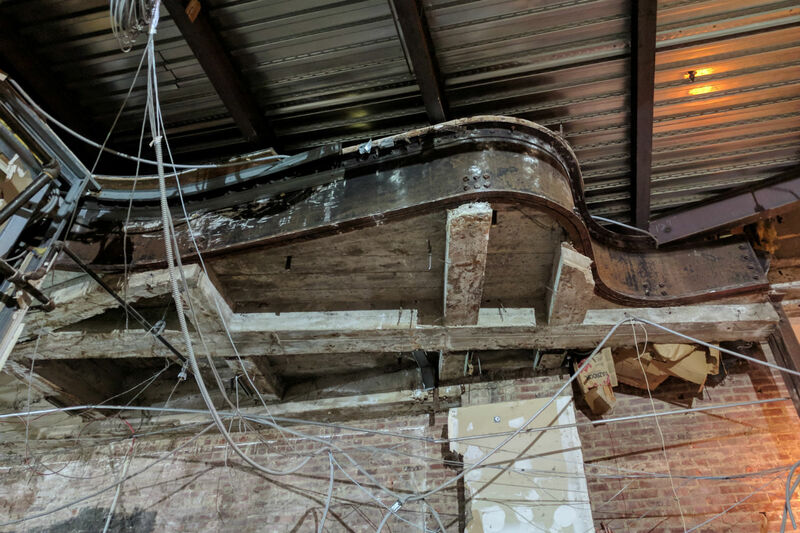 Workers also uncovered a pair of balconies, which date back to the theater's 1928 debut, that Viragh said will be preserved in the venue's new look. A secret staircase to the basement, now filled with equipment, was also revealed. The original Sanders theater boasted 1,516 seats, but after decades of neglect, it closed in 1978. The Pavilion opened in its place in 1996 but closed two decades later in 2016. Locals long decried the Pavilion's conditions siting broken seats, busted air conditioning and rumors of bed bugs, but Viragh said the below-the-surface neglect became clear during demolition as workers discovered strange holes in some walls and floors and poor construction of wooden joists. "There's been a lot of layers to peel back," said Viragh. "It needs a lot of TLC." 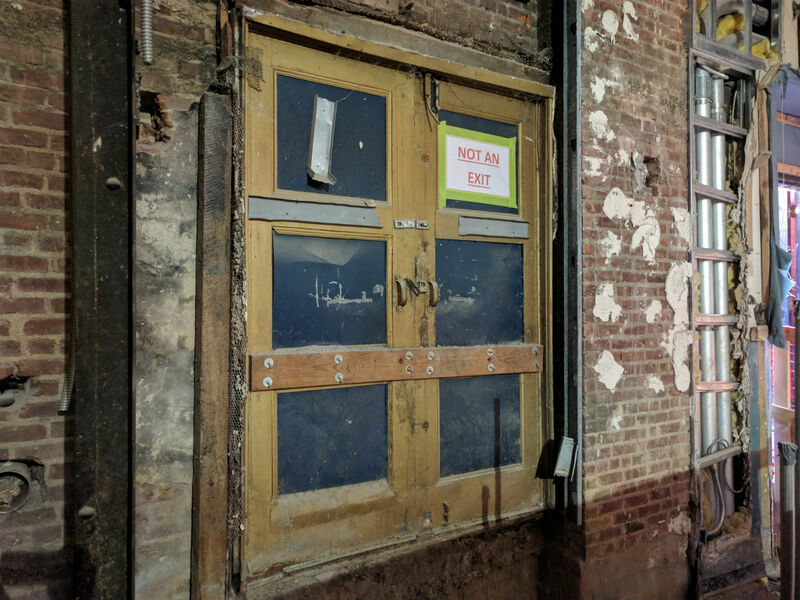 Nitehawk aims to uncover and fuse as much of the building's history into the refurbished 34,000-square-foot space as possible, which is three times larger than the first Nitehawk in Williamsburg. Elaborate ceiling panels such as the one above are among some of the more intricate details that will be saved. Along with a bronze door to nowhere from the 1920s that was bricked off and forgotten. Some features are being removed like the tin ceiling, which is not original. The only snag the project hit was trying to find an ADA accessible route for the elevators — not all of the Pavilion's lifts were handicap accessible — but builders were eventually able to find a "magic bullet" route that meets their needs, explained Viragh. Once the construction is complete, the freshly renovated Nithawk will boast seven screens, two bars and a full kitchen. Movie fans will have plenty of gourmet grub and concession fare to choose from along with idyllic views of Prospect Park from the second level.